Discover more about the history of the sport. How did it all start? What's the difference between ping pong and table tennis? The history of table tennis (also known as ping pong) has been the subject of extensive research, notably by Englishman Gerald Gurney and by American's Charles "Chuck" Hoey and Tim Boggan. But the research by Gerald Gurney - presented in "Table Tennis: The Early Years" - is considered to be the definitive guide to the history of the sport. The International Table Tennis Federation also have a museum where they preserve and promote the heritage of Table Tennis. 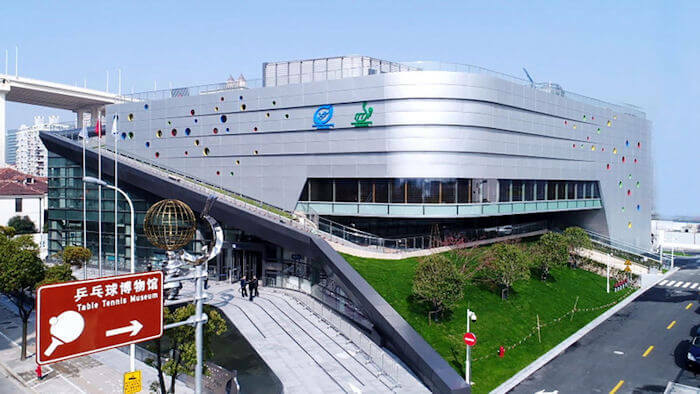 It opened in 2004 and was based in Lausanne, Switzerland but moved to Shanghai, China in 2014. The Museum is located at 796 Jumen Road, Huangpu District, Shanghai, China, and opens from 9am to 5pm from Tuesday to Sunday, with last admissions at 4pm. 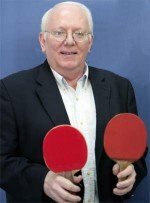 I've been involved in table tennis since 1971 as a player, organiser and reporter / writer, and I'd love to share my knowledge with you. The game was invented in the late 1880s when game makers tried to emulate the popularity of lawn tennis by developing indoor versions of it. But because these early versions of the game were made by several different manufacturers, each manufacturer used an exclusive patented or trademarked name for their own version. These included Indoor Tennis, Gossima, Whiff-Waff and Ping Pong. These games consisted of card games, board & dice games, rackets & balloon games and even tiddledy winks tennis games. But the first action game of tennis on a table was in 1890. For more information, see my article - Who Invented Table Tennis? Around 1898 the English sports company John Jaques & Son were manufacturing the first table tennis sets and popularising the game. They used rackets (bats / paddles) with velum stretched over an outer casing (similar to a small drum) attached to a handle. 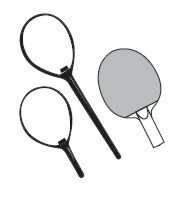 This gave rise to the name Ping Pong which was derived from the sound that was made by different sized rackets (bats / paddles) striking a ball. And as the popularity of the game spread in Europe, two rival organisations were set up in England with the "Table Tennis Association" and the "Ping Pong Association" formed within days of each other in 1901. But soon after this time in the history of table tennis it's thought that the game fell out of favour. But by the 1920s it was back in fashion, particularly in Europe. But what's the difference between ping pong and table tennis? Well, as we saw earlier, when the game started in the 1890s, various patented or trademarked names were being used by different manufacturers. So when the English sports company John Jaques & Son became the market leader in the 1920s with their version of the game called "Ping Pong", they decided that they would only allow their trademarked name to be used if their brand of equipment was specified exclusively. As more and more ping pong tournaments were now being organised, they also threatened legal action against anybody who used their proprietary trademarked name of Ping Pong without specifying the use of their equipment. Therefore an alternative name was required for this burgeoning international sport and the name Table Tennis was chosen. So, since that time, and particularly since the establishment of the International Table Tennis Federation (ITTF) in 1926, the modern game has been known as table tennis. 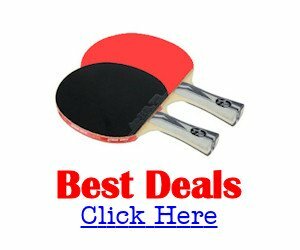 Why is the name Ping Pong still used? 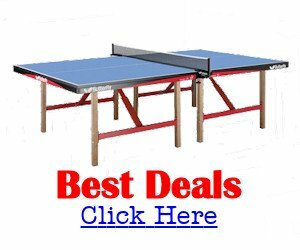 The name "ping pong" is still used in certain parts of the world, particularly in the USA, probably because it was promoted extensively in the early 1900s by the equipment manufacturers who owned the trademark, and therefore it became ingrained in peoples minds - just as any other product which is widely advertised and promoted. Indeed, Ping Pong is still a federally registered trademark in the USA and is now owned by Escalade Sports who still produce a brand of equipment called Ping Pong which is used to play the sport of table tennis. The name has also remained in popular use by the media all around the world (and by recreational players) who often use it in a derisory context about the sport of table tennis. So although many people use the names ping pong and table tennis interchangeably, Ping Pong remains a registered trademark and brand of equipment, whilst the official name for the sport since 1926 is table tennis. On 16 January 1926 at a meeting held in Berlin between representatives of the Table Tennis Associations of Austria, England, Germany and Hungary, a provisional "International Table Tennis Federation" (ITTF) was formed. The first General Meeting was scheduled for December 1926 and on 7 December 1926 Englishman Ivor Montagu (pictured right) was elected as the first chairman of the ITTF and five days later the first Constitution and Rules of Table Tennis were agreed. The rules for International Competitions, which were approved at that meeting on 12 December 1926, were based on the English rules of the game at that time for singles - subject to a few minor amendments - and the Hungarian rules of the time for doubles play. Austria, Czechoslovakia, England, Germany, Hungary, India, Sweden and Wales were all invited to become the original members of the ITTF. A tournament held in London, England from 6-11 December 1926 was also designated as the first World Championship. Since 1926 there have been many significant events which have taken place and many of these relate to changes to the rules of the game. Follow the links below to read more about them. These include introducing a time limit on games; lowering the height of the net; banning finger spin serves; the introduction of the two colour rule; changing the ball size from 38mm to 40mm; changing the scoring system from 21up to 11up; the introduction of racket testing and the introduction of plastic balls to replace celluloid balls. Other significant events include the introduction of sponge rackets; China first entering the World Championships; China offering Ping Pong Diplomacy; the introduction of speed glue; the introduction of combination rackets; becoming an Olympic sport; the formation of the ITTF Pro-Tour and separating the World Championship events. As the popularity of table tennis spread around the world, the Asian countries embraced the sport and quickly became world leaders. Although the European players, particularly Hungary and England, dominated the mens singles titles at the World Championship during the first 25 years, the Japanese and Chinese players have taken the majority of world titles from the 1950s onwards. A notable exception was Sweden who, with Jan-Ove Waldner and Jorgen Persson in their ranks, claimed the men's singles titles in 1989, 1991 and 1997 and won the team event in 1989, 1991 and 1993.